WELCOME TO MY ONE YEAR OLD BLOG!!! Thanks for dropping by :D. I’m so excited to share this with you all… and when I say this, I mean: a cocktail, some fiesta balloons and a handmade video where you will finally see my face! Taan!!!! Hear the drums? 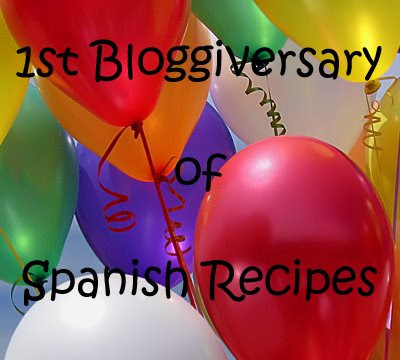 I’m so excited Spanish Recipes is one year old!!!! 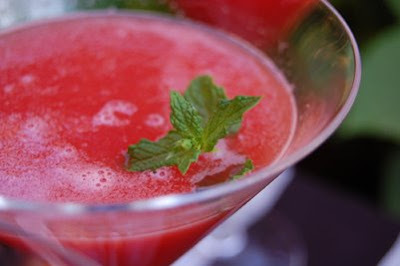 Please head to the terrace and have a drink: water melon+mango+rum, or vodka if you choose so. Ok, let me tell you that I’ve been working like a maniac to have this ready for you on Friday :D. All my data is still in the Pc and it stays in the IUC (intensive unit care). I know I promised a Cava’s Sangria… but, I’m soooo sorry I didn’t have the time to prepare it, but the promise stays and maybe during August you’ll get it :D. I’ve been taking photos, editing recipe pictures, trying to get the movie together and of course there’s always problems… have you ever started something in a hurry and came out ok at first instance? Let me take a sip! Hey, don’t be shy, help yourself, there’s only three on the table but the kitchen counter is full of them! Click my profile cartoon image to see the video. Thanks! woohoo!!! happy birthday to lovely, fun blog. enjoy your break, dear nuria. Oh and yum anything with rum is good! What a party! So much good food in one year. Cute video. Nice to see the real Nuria behind the cartoon. Have a great vacation. If you tune in great, if not, no worries, see you in Sept.Here is to another year of great Spanish food. Happy Bloggaversary Nuria. Mine’s next month and I am preparing a surprise as well, totally different, but I enjoyed every minutes of your video with the lovely music and food. You look lovely Nuria. Don’t use the cartoon again please. Have a nice summer and enjoy yourself my friend. I suppose we will all be away in August. Nuria, you made my day! The video is cute, creative, hilarious and entertaining…very much like the hostess of this blog. 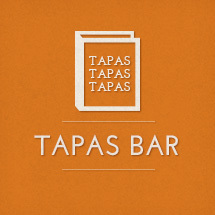 Congratulations on a year of great food and entertaining us with your sample of Spanish cuisine..MWAH! Yay! You’re officially one. That’s cause for celebration indeed. I’ll look forward to your video, but in the meantime, have a fabulous holiday! 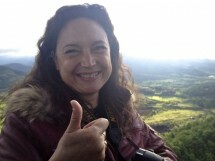 Feliz compleanos Nuria! What a great celebration…mas sangria for me por favor! And finally we get to see your beautiful face…please don’t hide behind the cartoon again. I lok forward to seeing more of your delicious treats in the near future…Buena suerte! 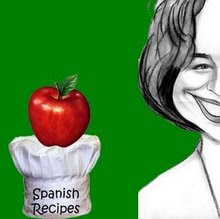 Happy Birthday to the wonderful Spanish recipes, one of the blogosphere’s best! Nuria, you do such a wonderful job with the blog and have shown yourself to be a good, kind, thoughtful, and funny person. 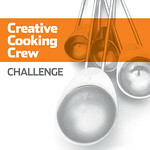 I really loved the video – great music and great food pictures. Plus, you win the prize for best use of kitchen tools – I particularly liked the tongs as eyeglasses! Great job all the way around – you have a lot to feel proud about. 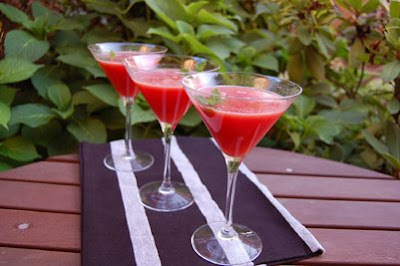 Enjoy your August vacation to the hilt and thanks ever so for the very tasty party drinks! I hope later when your PC is out of ICU you will sing for us! Nuria, you are just as cute as I imagined you! Love the video (and the song!). Congrats on your 1st bloggiversary. Here’s to many more! Happy Bloggiversary!!! I loved the video Nuria…you are just too cute! Thanks for the drink too, I really needed it! Happy Bloggaversary! Here’s looking forward to the next year full of delicious Spanish recipes! Happy 1st blog anniversary! Sorry about your pc! I have some of those same dishes!!! And thanks for the drink…YUM!!! Have a great summer holiday…. I absolutely LOVED the video Nuria. You are just so creative with your blog and the foods that come from your kitchen. Happy Bloggiversary and I’ll look forward to another year of great things!!!!!!!!!!!!!!! Cumpleaños feliz, Guapita! You are so cute and funny posing with those kitchen tools. I’m drinking a fruity cocktail on your patio to celebrate your bloggiversary. Cin Cin! wooo hoo one year! i love it how we all have parties for our, ehem blogs. people need to understand that they are like our children! or right arm, one of the two. love your video, im happy to have met you too in internet land! happy summer!! Felicitaciones y feliz primero blog-e-anos Nuria!! have a wonderful break and please come back refreshed and inspired with more recetas Espanoles! Happy Blogiversary!!! El video está genial, guapaaaaaa! What fun!!! Happy blogiversary. Great job on the video and of course we’ve enjoyed the amazing food all year. Congratulations and here’s to many more blog birthdays! Great video and your doggie is the best….I have one just him and he is in my blog all the time! I love the video, and the food all looks wonderful and you are muy guapa! and I’d love one of those cocktails! Gah, Nuria, my google reader isn’t reading you right now. Boooohoooo! Wonderful, wonderful video party! I also finally passed on my lovely awards. Come see when your PC is better. Muchas besas! (was that right? Ugh, my Espanol is terrible). Anthony Bourdain was in Barcelona tonight!!!! I’ll leave personal messages to you all a.s.a. I get back home. Meanwhile, I’m here at the end of the world with 53 Kbits/s (internet speed)… I’m forced to take things easily, it takes ages to download blog pages, so I gave up and just take life easy!!! Thanks for your comments on the video, I appreciate it :D! Hope you are having a great summer time with lots of piña coladas by the pool ;D or just anything that makes you happy. Love you all :D. See you soon!!! Hey Nuria-hope you are enjoying your vacation. When you get back there is an award for you over on my blog. Bee, thanks for dropping by! Chin Chin and Cheers! Hey Nathan! Thanks darling :D. Salud y por muchos años to you two! Thanks so much Susan! Happy summer to you too! Hola querido Peter! Thanks for your always nice and sweet words! See you so soon!!!! Wow Laurie!!! Those words made my fly!!!! I will treasure them! Thanks soooo much! It’s been wonderful to know you too♥ I’ll be going to your place in short, see you then sweetheart! Hola Guapísima Jenn! Thanks so much for dropping by and for such nice words ;D. I had to look for the meaning of mischievous… yeap! Siiii, I’m a bit “traviesa” it’s nice to add some pepper to life (you are this kind too, am I wrong?) See you soon, darling! Thanks so much darling Elly!!! See you soon! It’s high time to go back to the arena… he, he! Hola Judy! Thank you sweettie for dropping by! See you in short! Hola Miss SweetCakes! Thanks so much for dropping by Emiline! I’ll come and visit you shortly. Hola Linda! Thanks for the good wishes and for comming over! My PC’s funeral took place this week! Just kidding… but I lost all data!!! Hola Psychgrad! He, he, more cocktails on demand, just ask and your wishes will come true!!! Thanks so much for comming over, darling! Cin Cin and cheers to you too Heather! You do look tremendously guapa in that picture!!! Thanks for the good wishes! I’ll visit your place next week sweetheart! Bisous to you too Mallory! Thanks for dropping by! And for being there! I do love the fact that I met you too! See you soon guapa! Hola Jonny… and Amy! Thanks for the good wishes queridos♥ I’m going back to the “arena”, see you soon! Graaaaaaaaciassssss Nikki!!! Great you enjoyed it! See you in short querida! Hola Giz! Thanks so much querida! More fresh drinks in the kitchen counter!!! He, he, see you soon! Hey Denise! Welcome to Spanish Recipes!!! Thanks for your nice words! My doggie is a “she”… maybe we should make them meet each other! I’ll visit your blog in short to know more about you… meanwhile, cheers! Hola Familia! Muchas gracias for your nice words and for dropping by! I’m finally back home and with my batteries charged! Will visit you shortly!!! Jen, your Spanish is not that terrible! Muchos besos to you too!!! Thanks so much for dropping by so glad you enjoyed the party♥ See you soon sweetie! Valli… you are too sweet! I’ll see what it is and be back to you. Thanks querida! Mallory! I didn’t know who he was! I had to make a google search… never saw his program… ahhhhh I wish I could… My Tv channels are kind of Jurasic for you Americans (only 20 channels to choose) Will you tell me about it when he talks about Barcelona? Thanks for the info! Woweeeee! Judy, thanks a lot… OMG! I’ll be there in no time! Smuack! 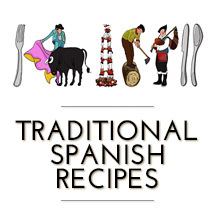 Welcome to Spanish Recipes Deeba! Thanks so much for the good wishes and there will always be a cocktail for you waiting in the fridge ;D. Happy summer! Hola Katie! Thank you darling! See you soon! Happy Blogiversary! Wishing you many more years of blogging! XMAS TRAFFIC GIFTS!!! Spanish Recipes TOP TEN. Foodbuzz 24, 24, 24. A Spanish Menu – My gift to the Winners of the Olympic Games.